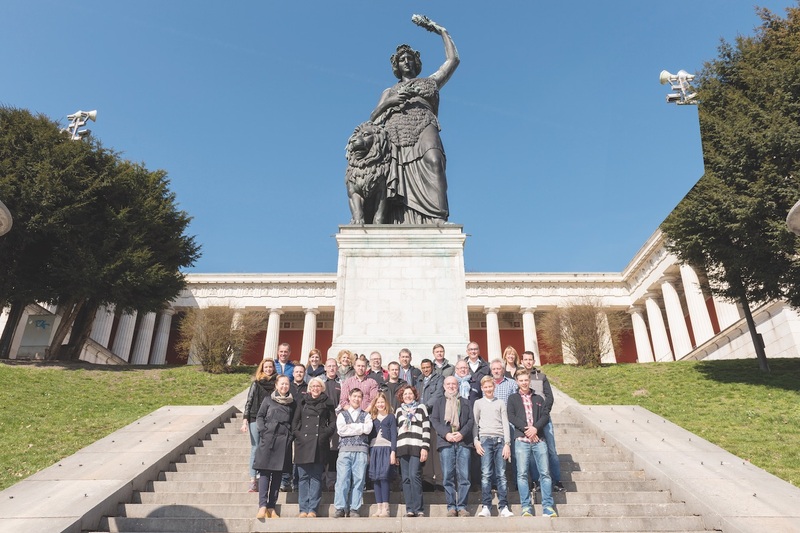 Our business in the Theresienwiese in Munich currently employs 21 people. In doing so, each area of Buchele Raumgestaltung has its permanent, experienced and specially trained employees, who, with their many years of experience, will be pleased to provide the customers with helpful support. Furthermore, we are also pleased to be allowed to train young people to become interior decorators. 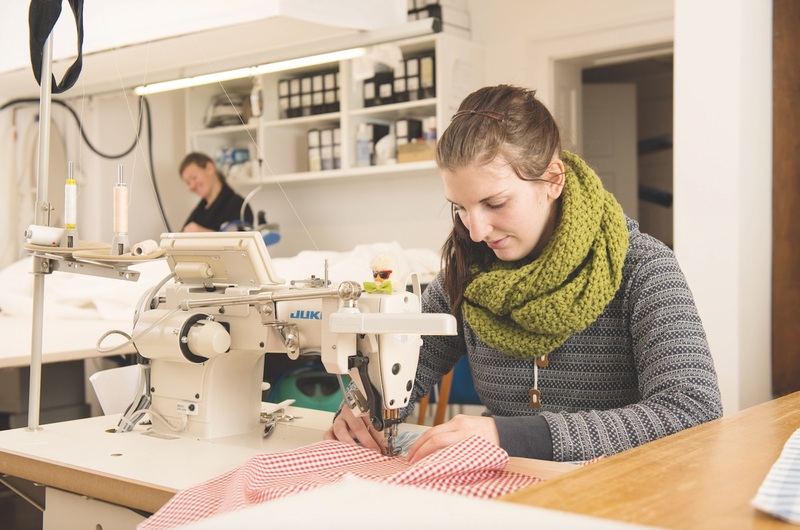 Our apprentices gain experience in all areas of the handicraft business during their training. Both our young as well as our experienced employees, who, in part, have already worked for our traditional company for more than 4 decades, guarantee that you will always be given a perfect result to your utmost satisfaction. The current managing director has been a member of the executive team since 1998 and in 2008, he took over the company from this father, Anton Buchele. The company has been owned by the family since 1895. Andreas Buchele continues the traditional handicraft in the fourth generation and even in the 21st century, he places a lot of importance on the high quality standards of the products of his interior decoration company. Stylish down to the very last detail, this is how the memorable showroom is presented with the cast-iron pillars in the Buchele courtyard building of the town hall on the Theresienwiese. 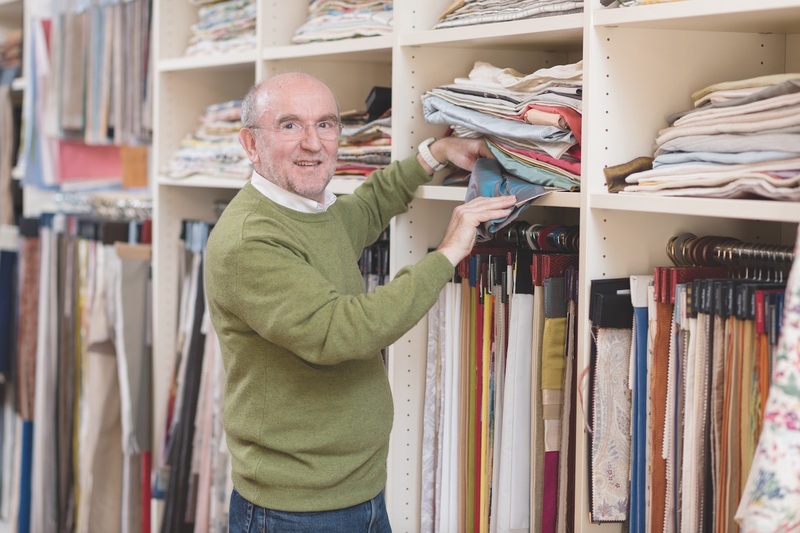 Andreas Buchele stands at the large wooden sales counter and with the customers, he appraises top-drawer wallpapers and fabrics that are stacked on shelves everywhere within reach. It is as if they were staged by themselves: The art of weaving and design on the one hand, have outlived the winds of time, on the other hand – in today’s clear design – they leave space for tradition and modern trends: in all styles and from exquisite natural materials, with timeless elegance or with the ever-changing demands of the respective lifestyle. Many of the fabrics are digitally printed or woven in-house – the finest damask through to the most precious brocade, with original models designed with Tegernsee hand printing on vintage linens and gauffrage fabrics. Even other embossing techniques, embroidery and applications for decorations. In between there are colourful floor covering collections, hand-tufted pieces of carpets and luxurious passaments from the Posamenten-Müller factory. In addition to Andreas Buchele, Wilfried Moser also knows all there is to know about this. 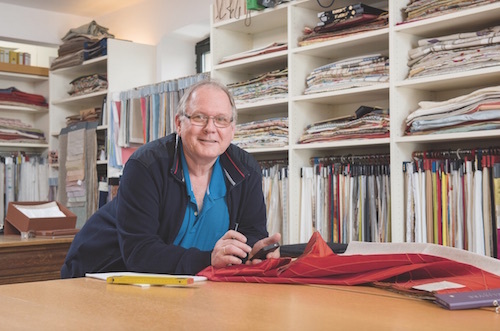 For the past two years, the former fashion designer, trained in textile design, theory of colours, painter and varnisher has been advising customers that come here with many wishes and questions on a freelance basis. In this cosy studio, Andreas Buchele also passionately develops unconventional overall concepts for textile interior design with emphasis – from planning through to execution. With a keen aesthetic sense, creativity and communicative abilities, he is able to bring together traditional handicraft and innovative design. In an advisory capacity, he discusses each detail with the customers and thus, in cooperation with architects and interior architects, he is able to meet all exclusive demands of living quality. “We stick together, we stand for our values, we are proud of our success and the Bavarian attitude towards life”. The words of the FC Bayern boss, Karl-Heinz Rumenigge, on the occasion of the 115th anniversary of the foundation of the club. These could be the words of the avowed FC Bayern fan, Willi Plum, said about the Buchele anniversary. His greatest experience was of course, the reception of the Munich football players after the successful, historical triple, for whom, his company laid out the red carpet in the Bavarian State Chancellery. 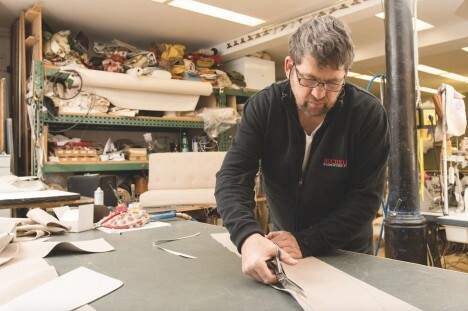 However, since the start of this apprenticeship more than forty years ago, Willi Plum usually loves spending most of his time in the upholstery workshop. “The machines are as old as us and still work like us”, he says with a knowing smile and then turns towards his colleagues and the upholstery work: classic with hand-tied springs, form or belt upholsteries, restorations but also the modern versions, in which the down-filled cushions and form pads made of current materials are en vogue. Or bizarre, like the currently processed dog bed that is studded with many Swarovski stones. However, they always produce something for everyone: from small works through to completely renovated interiors of the current “style of living” with their newly combinable materials. A small art nouveau bench is given a completely individual braided edge, the elaborate upholstery on the récamières, a challenge. Specially produced fabrics based on historical models, are used for the Jacob chairs in the Louis XVI style, other period furniture are provided with old tapestries. As if one were in a doll house, standing between true-to-scale raw models of sofas and arm chairs so that the customers are able to picture the finished end result. Here, sleek leather or rustic-solid deerskin is processed, double-sewn for the large doors of walk-in closets. Cow hides on bar stools, cord, velvet, linen and smooth fabrics in all colours and patterns on good pieces of furniture, as would be common at a fitting, are first pinned with great skill, until everything fits perfectly. During lunch break, Willi Plum creates slippers with the remaining fabric, he simply cannot get rid the handicraft. 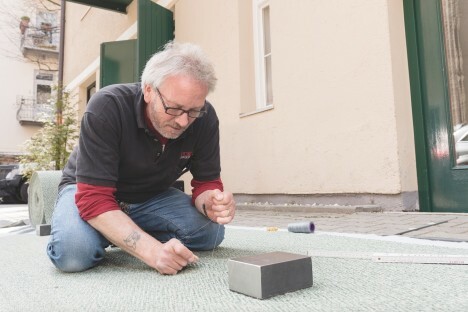 Since 2013, his son Moritz has been following in his footsteps and completed the training to be an interior decorator at Buchele. They are both enthusiastic FC Bayern fans, that goes without saying. According to the time of year, it was a slightly cooler Wednesday, when Horst Piott started his apprenticeship at Anton Buchele in 01.09.1976. He wanted to become an interior decorator because of the manual skills he “inherited” from his parents floor laying company. The training took three years. The result: a successfully completed final apprenticeship exam. The resourceful employee has continued to enjoy working for his “reliable and family-owned company”. 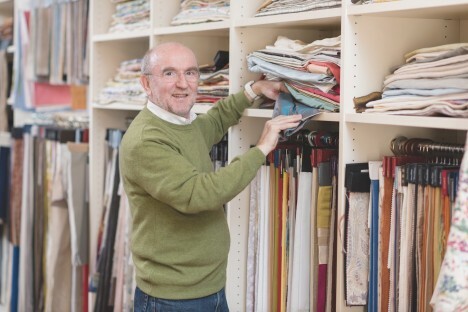 For almost forty years, he has been employed as an expert for exclusive wall coverings in particular. Using this great experience, he was able to innovatively and effectively line the walls in almost all major museums such as the re-opened Städtischen Galerie im Lenbachhaus, the Old and the New Pinakothek in Munich, the new Gemäldegalerie [picture gallery] and the old National Gallery in Berlin. Even the wall coverings in the rooms of the world-famous Nymphenburg Palace, the summer residence of Wittelsbach family and in the Baroque state rooms and the grand gallery of the impressive, new Schleissheim Palace were renewed by Horst Piott and his colleagues. The exquisite red brocatelle fabric needed for this was manufactured in special weaving companies in France and required great caution and expert knowledge when spreading it out. His strength is a good and easy relationship with many private customers who trust this vast knowledge when it comes to wall coverings, wallpaper and floor coverings. “There are no 0/815 wallpapers. You need to think about it – how should I do it, what is the processing like, you must estimate the course of time correctly.” Therefore, Horst Piott travels a lot so that the individual decorations reaching beyond the handicraft work are considered locally in advance. Since his one visit to Portugal, his great passion has belonged to the country on the Iberian Peninsula. Although he loves his home in Munich, Horst Piott drives to the south to be near the Atlantic as much as possible. In addition to his occupation, there is one thing that has always connected him to the senior partner Anton Buchele: the eternal love of cuisine, tasting and enjoyment. 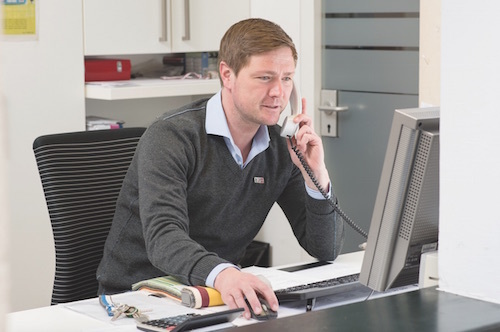 He is responsible for the administration and coordination in the office: In 1990, Markus Mayer started his training to be an interior decorator at Buchele and has been employed ever since his apprenticeship period and completed examination for the master craftsman’s certificate. The fact that he also took on board the business administration for the handicraft is now of significant importance for his current field of work. The timed work coordination for his colleagues, offer preparation and administrative tasks form his area of responsibility. As an all-rounder, he is a contact person for everything that has to do with a medium-sized business. Due to his many years of experience in interior decoration, some regular customers are very reluctant to work without Mr Mayer’s specifications on site. His favourite and most pleasant tasks include those of the “chief of protocol”, predominantly for the Bavarian State Chancellery. In doing so, with a leading role together with Andreas Buchele, he organised and supervised the political and ever so important social visit of Pope Benedikt XVI, who visited his Bavarian homeland in September 2006. Responsible for the red carpet through to the welcoming of important guests at the Franz-Josef-Strauss airport, for the mobile flagpoles and the elaborate stands towards Marienplatz, the lectern for the final official reception in the Munich Residence and the procurement of the associated equipment. “Nothing is allowed to go wrong”, said the scrupulous Markus, who loves cycling and climbing mountains in his free time. In an internship full of insights, Karl Bernhard took the opportunity to get a taste of the field of activity of a decorator. He enjoyed it so much that he went on an intensive search for an apprenticeship to become an interior decorator. Since 1965, this has been the official job title as a result of the renewal of the Handicrafts Regulation Act, it was previously known as “Upholsterer, Saddler or Decorator”. “The Anton Buchele company made an excellent impression on me and that’s where I applied”, he says. Thus, his career path started in the Buchele workshop as a young man, which at that time was still in the Kidlerstraße 10. This was 44 years ago. He has borne the master craftsman title for a long time and he still feels exceptionally good working here. From tender preparation to taking measurements through to the manual design work – there are plenty of interesting tasks – whether in Germany or abroad. Over time, there have always been highlights, be it the manufacture and installation of the reconstructed red stage curtain in the Munich State Opera, the valuable wall coverings in the museums and galleries of Berlin or the textile furnishing of the impressive “500 Jahre Post” exhibition in the castle of Princely Family of Thurn and Taxis in Regensburg. Here, a woven sisal rug was laid out, the vitrines were fitted with fabric, the striking curtains draped and a walkable globe was composed of felt – unique in its effect. In his free time, Karl used to love Alpine skiing and in the summer, he was always on the tennis court. 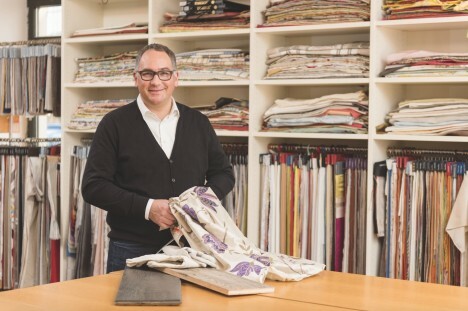 Now he very much enjoys being at home and allows himself to be spoiled by his wife with good Bavarian home cooking..
Cristina Scherdi’s cutting table is covered with metres of material treasures such as velvet, shimmering silks or chintz-like cotton. The young assistant turned her passion into a career and in 2007, she started her apprenticeship to be an interior decorator at Buchele. She has experienced all sectors of this demanding work. Today, she presides over the sewing workshop and is well-acquainted with the particularities of different materials. In memory of her predecessor, Lieselotte Widmann, who worked for Buchele for more than forty years, she has lovingly named her traditional Pfaff sewing machine, “Lotte”. Together with the blind-stitch sewing machine for invisible stitches and a mobile suitcase-sewing machine, these make for unique sewing rooms in a bright workshop. The linker quietly purrs while “casting”, binding the edges of fabric. Fine, cleanly sewn lengths of fabric fall from accurate to size length-cutting machine, in order to be able to precisely determine the length of the curtains. Careful, manual processing is a prerequisite when dealing with valuable fabrics. Here Roman blinds and completely hand-made, lined and molleton-lined curtains in all designs are created with or without passements or “added” braids or fringes. Decorative pelmet, very delicate curtains and net curtains, throws for beds and well coordinated unique table cloths with handworked details are produced and perfectly ironed in the Buchele sewing workshop. Cristina Scherdi’s home town is Apfeldorf near Landsberg. Another passion of hers, includes traditional Bavarian brass band music. There, she plays the flugelhorn at the Blaskapelle Hofstetten.